Windows Mail API - a framework for developing Windows Mail plugins and smooth integration with custom applications. 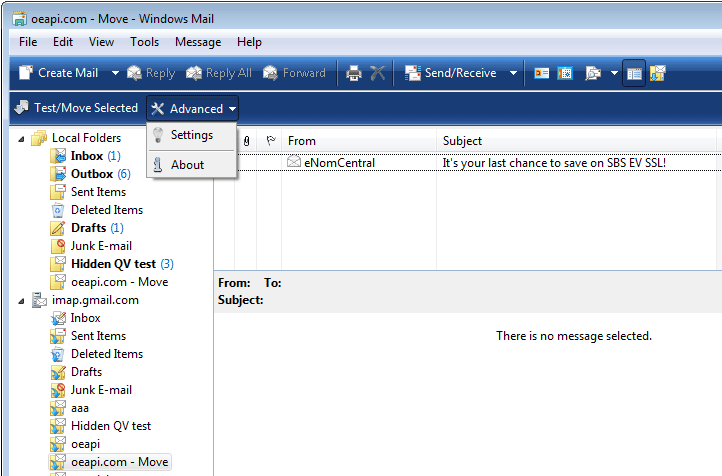 It supports adding new toolbars to main window and to compose email window. Message store interfaces allows accessing individual emails, folders and account information. API allows interacting with a user by sending various notification events to a custom plugin, including message and folder selection change notifications, new message receiving, folder creation, renaming and deletion, new compose window popup. OEAPI also supports outgoing email interception and modification. Outgoing email can be cancelled. OEAPI provides a unified application programming interface for customization and integration to popular email client software on Microsoft Windows. It supports Windows Live Mail 2012 and Windows Live Mail 2011 on Windows 8, Windows 7 and Windows Live Mail XP on Windows XP and Vista, also Outlook Express and Windows Mail, including 64 bit versions. An extension once designed for a single email client can automatically work with other supported email clients. 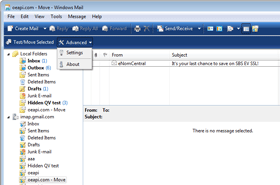 For example, an application implemented for a Windows Live Mail will automatically work with Outlook Express and Windows Mail. LiveKit.dll is a lightweight dynamic link library. The size is less than 500KB. It implements a set of COM interfaces. LiveKitInside.dll is a lightweight .Net 2.0 and .Net 4.0 assembly. The size is less than 800KB. It provides a natural support for .Net languages such as C# and Visual Basic.Net. I would like to take this opportunity and express my total satisfaction from your state of the art product. Your product met my needs entirely and is proven to posses many characteristics and qualities that I was looking for. I am also impressed with the flexibility of your API and its ability to answer several of my needs at once. Copyright © 2008-2015. Optimal Extention. All rights reserved. Outlook Express, Windows Mail, and Windows Live Mail are registered trademarks of Microsoft Corporation. Other products' names may be trademarked by their respective owners. This site is not affiliated in any way with Microsoft Corporation.